Hepalink Pharmaceutical (SHE: 002399) has closed a license agreement and entered into a stock purchase agreement with Resverlogix Corp. (TSX: RVX). Under the terms of the agreement, Hepalink purchased 12.63% of Resverlogix common shares for $27 million. Hepalink will develop and commercialize Resverlogix’s lead candidate apabetalone (RVX-208) in China. Resverlogix will be eligible to receive sales-based milestone payments ($5-90 million) and royalties (6%). RVX-208 is a derivative of resveratrol, an antioxidant that is commonly found in the skin of grapes. As you may have known, Resverlogix’s name is derived from resveratrol. Recently, RVX-208 was identified as a BET inhibitor specific for BRD2, with an IC50 value of 0.51 μM. The compound was designed to raise HDL-C, the so-called good cholesterol. In April 2008, GlaxoSmithKline paid $720 million to acquire Sirtris Pharmaceuticals (NASDAQ:SIRT) and its special formulation of resveratrol known as SRT501. However, the Phase II trial of SRT501 was halted in November 2010, because several patients in the trial developed kidney failure. Resverlogix has completed two Phase IIb trials known as SUSTAIN (24-week, 176 patients), and ASSURE (26-week, 324 patients). In the pooled data analysis, RVX-208 significantly increased HDL-C levels by 7.69%. RVX-208 decreased the incidence of major adverse cardiac events (MACE) by 55%, and lowered MACE by 77% in patients with a history of diabetes. While I am supportive of phase III trials with RVX-208, I think it involves great risks. It was commonly believed that raising HDL-C should lower cardiovascular risk. However, recent studies have called the HDL hypothesis into question. CETP inhibitors and niacin raised HDL-C levels but failed to reduce cardiovascular risk. the HDL cholesterol level has a role solely as a risk marker and not a risk factor that merits intervention to reduce cardiovascular events. Although higher HDL cholesterol levels are associated with better outcomes, it is time to face the fact that increasing the HDL cholesterol level in isolation seems unlikely to offer the same benefit. Resverlogix believes RVX-208 is different. RVX-208 helps the body to create new HDL particles which are more effective in pulling cholesterol out of plaques. However, the ASSURE trial did not meet its primary endpoint of plaque regression as a result of unexpected strong placebo results. The Phase IIb trials were directed by Dr. Steven Nissen, one of the world’s most eminent cardiologists. However, the Phase IIb trials were conducted outside the US. These early and small trials are not enough to prove that RVX-208 really could reduce MACE. To prove this, a large Phase III trial involving 20,000+ patients is warranted. Take Orexigen Therapeutics’ (NASDAQ: OREX) 9,000-patient LIGHT trial as an example. The first 25% interim analysis suggested Contrave not only helped patients lose weight but also prevented MACE (55 vs. 35). However, the next 25% of data showed that 43 patients in the placebo group had MACE compared to 55 on Contrave. Resverlogix is planning a Phase III clinical trial known as BETonMACE in high-risk cardiovascular disease patients with diabetes. Hepalink will be responsible for the Phase III costs in China. If all goes well, Resverlogix will launch the drug in 2020. Proc Natl Acad Sci USA. 2013, 110(49), 19754-19759. N Engl J Med. 2014, 371(3), 271-273. Five Prime Therapeutics (NASDAQ: FPRX) announced a license agreement with Inhibrx for novel GITR antibodies on Thursday. Under the terms of the agreement, Five Prime will pay Inhibrx a $10 million license fee and up to $442.5 million milestone payments. Inhibrx was co-founded by Dr. Quinn Deveraux who leads the R&D for the company. Prior to founding Inhibrx, Deveraux spent 10 years at the Genomics Institute of the Novartis Research Foundation. In 1997, Deveraux revealed the mechanism of IAP (inhibitor of apoptosis protein), the first known cellular inhibitor of caspases. Inhibrx’s lead candidate, INBRX-103, was licensed by Celgene for 500 million in June 2012. The mAb targets CD47 on cancer cells. CD47 interacts with SIRPα on macrophages and sends a “don’t eat me” signal. INBRX-103 has entered clinical studies in early 2015. Back to the topic, GITR (also known as TNFRSF18) is a member of the TNF receptor superfamily. The protein is mainly expressed on regulatory T cells (Tregs, CD4+CD25+) that suppress immune responses. GITR agonists suppress Tregs and thereby enhance immune responses. Thirteen years ago, Japanese immunologists first found that activation of GITR abrogated Tregs-mediated immune suppression. GITR Inc. (Tolerx Inc.) is developing a first-in-class GITR agonist called TRX518 in melanoma. The Phase I trial of TRX518 was initiated in 2010, but it is still recruiting patients at present. Inhibrx believes its INBRX-110 is the best-in-class GITR antibody. Based on Inhibrx’s multivalent antibody technology, INBRX-110 activates GITR independent of Fc binding. This is in contrast to conventional GITR antibodies. Genentech, Bristol-Myers Squibb, and AstraZeneca are developing co-stimulatory antibodies that target other members of the TNF receptor superfamily such as CD40 (TNFRSF5), OX40 (TNFRSF4), 4-1BB (TNFRSF9). It is commonly believed that adding co-stimulatory antibodies to anti-PD1 therapy can enhance the antitumor immunity. Nat Immunol. 2002, 3(2), 135-142. When we find a disease-causing protein, the first thing would be finding a small molecule or an antibody to inhibit it. Professor Craig Crews at Yale University has another idea —- directly degrade the disease-causing proteins. Crews’ technology, known as PROTAC (proteolysis-targeting chimaera), is building on a natural process where proteins are tagged for degradation by ubiquitin. PROTACs are bifunctional small molecules that bridge target proteins to E3 ubiquitin ligase, labelling it for degradation. Source: ACS Chem Biol. 2008, 3(11), 677-692. Crews lab has created various PROTACs targeting cancer-promoting proteins including MetAP-2, AR, ER, FRS2α and PI3K. In 2012, Yale licensed patents on PROTACs to GlaxoSmithKline to pursue undisclosed cancer targets. In September 2013, Arvinas was established with a $15 million A round from Canaan Partners and 5AM Ventures, to commercialize Crews’ PROTAC technology. Merck and Arvinas inked a $434 million deal on April 7, 2015. I don’t see PROTACs as a practical drug class to date because of its relatively mild biological activity. Knockdown of PI3K in MCF-7 cells needs 20-40 µM concentrations of PROTAC. Anti-PI3K PROTAC only demonstrated a moderate anti-tumor effect in ovarian cancer mice. Wait for better preclinical results. Proc Natl Acad Sci USA. 2001, 98(15), 8554-8559. Mol Cell Proteomics. 2003, 2(12), 1350-1358. Proc Natl Acad Sci USA. 2013, 110(22), 8942-8947. Novartis launched a $750 million collaboration with Aduro Biotech to develop STING agonists, adding new firepower to its portfolio of cancer immunotherapies that includes CAR-T program and checkpoint inhibitors targeting PD1, LAG3, and TIM3. The STING receptor is generally expressed at high levels in immune cells. Once activated, the STING receptor initiates broad immune responses, inducing the expression of interferons and chemokines. STING receptor can be activated by a series of unique nucleic acids called cyclic dinucleotides (CDNs), naturally produced by bacteria and immune cells. Aduro has developed CDN derivatives that are significantly more potent than natural CDNs. Aduro’s lead product candidate targeting STING is ADU-S100. The company plans to initiate a Phase I trial in the second half of 2015. In the preclinical study, intratumoral injection of ADU-S100 had superior anti-tumor activity as compared to HBSS (placebo control) and TLR ligands (positive control). Here are two photographs of melanoma model lung metastases. 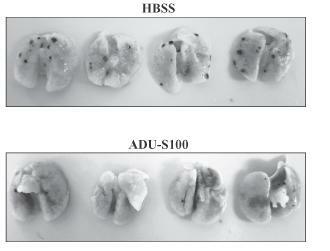 Numerous lung metastases (black nodules) are visible in the control group (HBSS), while only a few metastases are visible in the ADU-S100 group. Novartis is the second Big Pharma to form a partnership with Aduro. In 2014, Johnson & Johnson licensed prostate cancer vaccine ADU-741 and lung cancer vaccine ADU-214 for $365 million and $817 million, respectively. Furthermore, the FDA has granted Breakthrough Therapy Designation for Aduro’s pancreatic cancer vaccine CRS-207. FierceBiotech listed the company as one of 2014’s Fierce 15 biotechnology companies. The company has filed for a $86 million IPO. A few days earlier, Zhengzhou University out-licensed a cardiovascular candidate called BZP (布罗佐喷钠) to Ausun Pharmaceutical (奥翔药业). The drug was discovered by Junbiao Chang (常俊标) who is the vice principal of Zhengzhou University. BZP is a patented compound derived from butylphthalide (NBP) which was originally isolated from celery (芹菜). In 2002, CSPC Pharmaceutical launched butylphthalide in China for the treatment of mild to moderate acute ischemic stroke. Junbiao Chang has filed two patent applications (CN100554259, CN101402565) related to butylphthalide derivatives. The best compound claimed in the two patents is 5-bromo-2-(1-hydroxypentyl)benzoate, a bromine substituted compound of 2-(1-hydroxypentyl) benzoate (PHPB). PHPB, the ring-opening derivative of NBP, has been patented by Chinese Academy of Medical Sciences (WO03095412). Recently, Biovalley Pharmaceutical (生物谷药业) initiated a placebo-controlled Phase IIa trial (CTR20132923) to evaluate the safety and efficacy of PHPB in patients with acute ischemic stroke. It is surprising that the patent WO03095412 doesn’t cover the halogenated derivatives of PHPB. Anyway, in my opinion, it is not a good idea to develop such a belated me-too drug with a highly similar structure to the lead compound. Moreover, Zhengzhou University out-licensed the nucleoside analog reverse-transcriptase inhibitor azvudine (FNC), another me-too candidate identified by Junbiao Chang, to 北京兴宇中科 for RMB 40 million in 2011. Last year, the CFDA approved the IND application of azvudine within 3 months. It is uncommon for the CFDA to review an IND so fast. 河南真实生物科技 is currently testing the drug in HIV patients in the Phase I trial (CTR20140526). 乔地, 苏雨. 郑州大学研发一类新药卖了四千五百万元. 科技日报. 2014-11-30. J Pharmacol Exp Ther. 2006, 317(3), 973-979. PLoS One. 2014, 9(8), e105617. Sinopharm in-licenses AEZS-108 with $1 million upfront payment, necessary? On December 2, Sinopharm A-Think Pharma (国药一心制药) in-licensed greater China rights to zoptarelin doxorubicin (AEZS-108, AN-152) for the treatment of endometrial cancer. The seller, Aeterna Zentaris (NASDAQ: AEZS), will be entitled to receive a $1 million upfront payment. AEZS-108 is a doxorubicin-LHRH conjugate, which was first reported by Andrew Schally in 1996. It was designed as a magic bullet which targets cancer cells expressing LHRH receptors. The rationale is similar to that of antibody-drug conjugates. LHRH receptors are expressed in about 80% of human endometrial and ovarian cancers, 86% of prostate cancer, and about 50% of breast cancers. Although LHRH receptors are detected in healthy reproductive tissues, they are expressed only at low levels or not at all in other tissues. The drug has been tested in patients with LHRH receptor positive endometrial cancer, ovarian cancer, prostate cancer, and triple-negative breast cancer. From April 2008 to November 2009, 44 patients with LHRH receptor positive advanced or recurrent endometrial cancer were treated with AEZS-108. Two patients (5%) had a complete response, eight patients (19%) achieved a partial response, and twenty patients (47%) met the criteria for stable disease. The median time to progression (mTTP) was 7 months, and the median overall survival (mOS) was 15 months. The most frequently reported grade 3 or 4 adverse effects were neutropenia (12%) and leucopenia (9%). The current standard therapy for advanced and recurrent endometrial cancer is the combination of cisplatin, doxorubicin, and paclitaxel (TAP therapy) which demonstrated an objective response of 57% and a mOS of 15.3 months. The most frequently reported grade 3 or 4 adverse effects were neutropenia (59%), thrombocytopenia (22%). AEZS-108 achieved a comparable survival with lower toxicity than TAP therapy. In recent years, the combination of carboplatin and paclitaxel (TC therapy) has been commonly used in advanced and recurrent endometrial carcinoma[7,8]. More importantly, AEZS-108 achieved responses in patients who had previously received TC therapy. Aeterna Zentaris is currently conducting a Phase III trial (ZoptEC, NCT01767155) in platinum-paclitaxel pretreated endometrial cancer. According to the analysis from Samreen Agha, the patents for AEZS-108 will expire in 2016. Don’t worry! The FDA has granted AEZS-108 orphan drug designation which provides a period of 7-year market exclusivity. Strangely enough, why should Sinopharm pay for intellectual properties which will expire before the approval of the CFDA? Proc Natl Acad Sci USA. 1996, 93(14), 7269-7273. Expert Opin Investig Drugs. 2012, 21(6), 891-899. Int J Gynecol Cancer. 2014, 24(2), 260-265. Gynecol Oncol. 2014, 133(3), 427-432. Clin Cancer Res. 2014, doi: 10.1158/1078-0432.CCR-14-0489. J Clin Oncol. 2004, 22(11), 2159-2166. Gynecol Oncol. 2008, 109(2), 250-254. J Clin Oncol 32:5s, 2014 (suppl; abstr TPS5630^). Samreen Agha. Aeterna Zentaris: A Risk Worth Taking. 2014-09-09. On November 4, Dana-Farber Cancer Institute and Astellas Pharma announced a three-year collaboration to research and develop small molecule covalent KRAS inhibitors for the treatment of cancers. KRAS is a oncogenic GTPase involving in many signal transduction pathways. About 97.7% of pancreatic ductal adenocarcinoma, 44.7% of colorectal adenocarcinoma, 30.9% of lung adenocarcinoma, 22.8 % of multiple myeloma, and 21.4% of uterine corpus endometrioid carcinoma harbor activating KRAS mutations. Howerver, KRAS is a well-known undruggable target. Small molecules targeting the guanine nucleotide binding site of KARS is difficult because both GTP and GDP bind to Ras with sub-nanomolar affinity and their intracellular concentrations are very high. Worse, there is no known allosteric regulatory site that would allow tight binding of small molecules. Despite more than three decades of effort by academia and industry, no effective RAS inhibitor has been approved. KRAS G12C is a common activating mutation present in roughly 50 % of Ras-driven lung adenocarcinomas. This mutation places a cysteine adjacent to the active site, providing a covalent approach targeting KRAS. Covalent inhibitor could overcome the problem of high competing GTP/GDP. SML-8-73-1 is a GDP analogue which contains an electrophilic chloroacetamide attached to the beta phosphate, that can covalently modify Cys12 of KRAS mutant. SML-10-70-1, a prodrug of SML-8-73-1, inhibits lung cancer A549, H23, and H358 cells with an EC50 of 43.8 μM, 47.6 μM, and 26.6 μM. In November 2013, a non-nucleoside covalent KRAS inhibitor was reported in Nature. This compound inhibits lung cancer H1792 cells with an EC50 of 0.32 μM. Considering the low-affinity of SML-8-73-1, continued chemical optimization could be warranted before clinical test. Nat Rev Drug Discov. 2014, 13(11), 828-851. Angew Chem Int Ed.2014, 53, 199-204.